The thought of starting a yoga practice can be overwhelming for a beginner. With so many poses, styles, and classes to take, it can be tricky to know where to start. If you’re looking to get into a practice, begin by learning these foundational poses and sequences. They will help you get an idea of the basics of yoga, and prepare you for an at-home practice or beginner yoga class. Child’s Pose, or Balasana, is a restorative pose that helps you relax, bring your focus to your mat, and stretch the back, thighs, and ankles. Downward Facing Dog, or Adho Mukha Svanasana, is an all-over body stretcher and strengthener that you will find in most yoga flows. Before settling into stillness, allow yourself to focus the stretch on the back of your legs by bending one knee and then the other. You may also choose to bend both knees at the same time, and then push back through your heels towards straight legs. Find stillness, and then release back down to your knees. Three Legged Dog, or Eka Pada Adho Mukha Svanasana, is a layer that you add on to Downward Facing Dog, and is often used to transition to other poses. Start in Downward Facing Dog. On an inhale, lift your right leg up and back into the air. Only lift it as high as is comfortable, and ensure that your hips remain squared to the ground. Flex your right foot as you continue to stretch through the leg. Ensure that you are still pushing back and up through your tailbone, and that your head is active and aligned between your arms. Release your right foot back down to the ground, and repeat with the opposite leg. Upward Salute, or Urdhva Hastasana, is an energizing pose that stretches the entire body. Start standing, with your feet parallel to each other, either together or hips-width distance apart. Roll your shoulders back and elongate through your spine. On an inhale, sweep your arms up by your sides and over your head. Your arms should be shoulder-width distance apart, with your palms facing in towards each other. Feel your feet on the mat, and ground down through all four corners of your feet. Ensure you continue to elongate through your spine, and keep your shoulders away from your ears. Your gaze should remain straight in front of you. To release, slowly bring your arms back down to your sides. You’ve likely already practiced Standing Forward Fold, known in Sanskrit as Uttanasana. Practicing the pose is an excellent way to stretch the hamstrings, as well as release tension in the back and neck. Begin standing, with your feet hips-width distance apart. On an inhale, bring your arms above your head, going into Upward Salute. On an exhale, bend at your waist and begin to reach forward and down, keeping your spine elongated as you descend. Allow your head to remain heavy, with your gaze behind you. On each inhale, lengthen through the spine, and on each exhale, gently fold even further. To release, come back up with arms extended and spine elongated, just as you went into the pose. Standing Half Forward Fold, or Ardha Uttanasana, is a simple layer of Standing Forward Fold that helps you further lengthen the spine while activating your core. Start from a Standing Forward Fold. On an inhale, lift your torso so that it is parallel to the ground. Place your hands on your shins, or let your fingertips graze the floor if your flexibility allows for it. Elongate through your spine, and keep your head active with your gaze directly below you. Ensure that your shoulders stay away from your ears. Release back down to Standing Forward Fold on an exhale, and then rise up to standing. Low Lunge, or Anjaneyasana, works into the hips and quads, making it a great pose for lower body stretching. Begin in Downward Facing Dog. On an inhale, sweep your right leg up behind you into Three Legged Dog, and on your next exhale, step it forward between your hands. Bring the left knee down to the ground. If necessary, slide it back so you feel more of a stretch in the quads. Your back foot should be untucked. Ensure that your right knee is stacked over the ankle. On an inhale, engage your core and begin to lift your chest, sweeping your arms up beside your ears. Elongate your spine, and drive your tailbone down. Keep your gaze forward. To release, bring your torso forward and palms back down to the ground on either side of your foot. Lift your back knee, and then step back into Downward Facing Dog. Repeat the pose on the opposite side. Cat/Cow, or Marjaryasana, is a gentle warm-up pose that brings movement to the entire spine, making it a great back and neck tension reliever. Start in a tabletop position, with your hands and knees on the ground. Ensure your palms are stacked directly underneath your shoulders, and your knees underneath your hips. On an exhale, move into Cat. Round your spine up towards the ceiling while tilting your tailbone down, and tuck your chin down towards your chest. While your head is tilting down, ensure you still leave space between your chin and chest. On your next inhale, move into Cow. Raise your head and face forward, and tilt your tailbone up, letting your back curve. Ensure you don’t tilt your head back too far or over arch your back, as it can result in strain. Continue slowly alternating between Cat and Cow pose a handful of times. Give yourself time to fully feel the stretch as you breathe through the pose. Happy Baby Pose, or Ananda Balasana, is a relaxing posture that opens the hips, stretches the hamstrings, and releases tension from the low back. Begin lying on your back. On an exhale, bring your knees into your chest. Separate your knees and bring them towards your armpits, and keep your feet apart. Take hold of the outer edges of your feet with your hands. You can also hold onto your calves if you are unable to reach your feet. Ensure that both your tailbone and your head remain on the ground. Your shins should be about perpendicular to the ground. To release from the pose, bring your knees back into your chest, and then plant the soles of your feet on the ground. Plank Pose, or Palakasana, is an all-over body workout that strongly engages your core, as well as your arms, legs, back, and spine. Begin in a table top position on your hands and knees. Your wrists should be stacked underneath your shoulders. Your palms should press firmly into the mat. Tuck your toes and step your legs back, so that you are in a straight line from your head to your heels. Your neck should be active but relaxed, with your gaze down at the mat. Bring awareness to your hips, and make sure they are in line with your body, rather than sinking or coming up too high. Ensure that your shoulders are still stacked over your wrists, and focus on pressing through the thumb and index fingers. Try holding for at least 30 seconds, but hold for longer if possible to build up more strength and stamina. To release, carefully lower back down to your knees. Warrior II, or Virabhadrasana II, is a key pose that you’ll find in many yoga classes. It helps to build stamina and body awareness while strengthening the legs, core, and arms. Begin standing, with the outer edge of your left foot paralleling the front edge of your mat, so that you are facing the side of the room. Step your feet about 3 and a half to 4 feet apart, keeping them aligned. Turn your left toes about 90 degrees, so that your toes are pointing towards the top of the mat. Turn your right toes slightly in, so that they are at a 45 degree angle. Lift your arms up to shoulder height, with your left arm pointing forward and right arm pointing back. Your palms should be facing down, and your arms should be engaged. On an exhale, bend into your left knee, working towards creating a 90 degree angle with your shin perpendicular to the floor and your thigh parallel. Your knee should align directly over your left ankle. Your hips should be squared towards the side of the room, and your gaze should be in front towards your left finger tips. Push through the outer edge of your right foot, and ensure that your torso is upright and not leaning forward. Bring awareness to your shoulders, ensuring they are not creeping up towards your ears. To release, straighten your left knee, release your arms, and step your feet back together to repeat on the opposite side. Reclined Spinal Twist, or Supta Matsyendrasana, is a gentle way to stretch your whole back and lengthen your spine, while also giving extra attention to your shoulders and low back. Begin laying down, with your arms extended horizontally. Bend your knees and place the soles of your feet on the ground, close to your glutes. Keeping your legs together and bent, swing them to the left side towards the ground, with your right leg on top of the left. Turn your head to the opposite side, letting your gaze fall towards your right hand. In this twist, you may feel your opposite shoulder wanting to lift, so be mindful of keeping it grounded and away from your ears. Return your gaze to the center, and repeat on the opposite side. 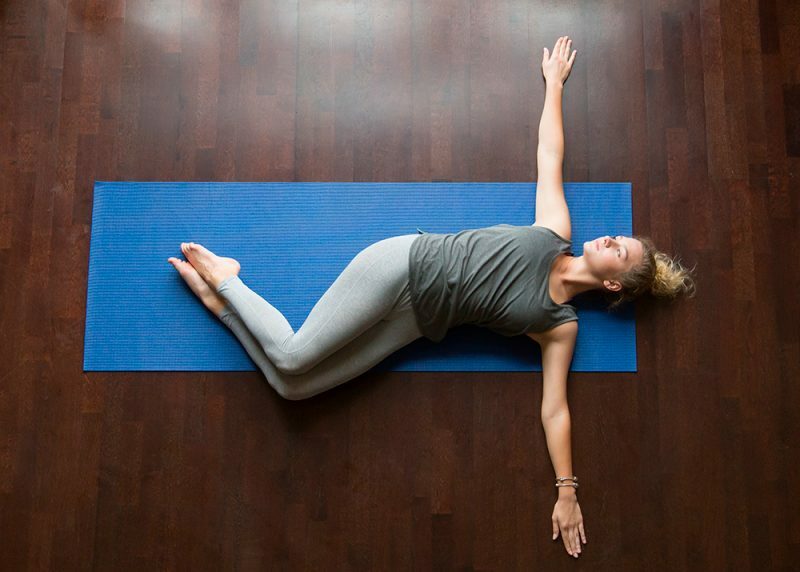 Corpse Pose, or Savasana, may look simple, but it can actually be a very challenging posture. The pose helps you relax deeply and let go of tension, but it can be tricky to truly quiet your mind and let yourself just be. However, with practice, you’ll be able to strengthen your ability to relax and let go, and will be able to reap the full benefits of the pose. Lie down on your back. Let your feet fall outward, and place your hands about 6 inches away from your body, with your palms facing up. Before fully getting into Savasana, get completely comfortable by getting any fidgets out and adjusting your position. Once you have found stillness, close your eyes and pay attention to your breath. You can do a body scan by focusing on a body part and releasing tension in that area. Allow your eyes to rest deeply in their sockets, and let your breath be deep and slow. To release from the pose, roll over to one side into fetal position, and then slowly guide yourself back up to a seated position. This sequence will allow you to get a full body workout while exploring the poses outlined above. Hold each pose for about 30 seconds or longer before moving onto the next in the list. If you are doing a pose that has to be repeated on the opposite side, be sure to hold it for the same amount of time on the other side in order to balance your body. After trying the sequence above a few times and gaining confidence in your knowledge of the poses, try doing the following flow. The idea with a flow is to move through the poses fluidly, coordinating your breath with each movement. For example, you will inhale as you move into an Upward Salute, and then exhale as you move into a Forward Fold. You can do this, or stay in each pose for a few breaths if you need a slower practice. Stay in Child’s Pose for a couple breaths, so that you can center your focus. If at any point during the flow you feel the need to catch your breath or refocus, you can come back down to Child’s Pose. Push up to table top from Child’s Pose. Move into Cat on an exhale, and Cow on an inhale, going through each a handful of times until your spine feels warmed up. From table top, on an inhale tuck your toes and push back into Downward Dog. From Downward Dog, on an exhale step your feet towards your hands into Forward Fold. On an inhale, lift into Standing Half Forward Fold. On an exhale, move back into Forward Fold. On an inhale, rise into Upward Salute. On an exhale, bend back down into Forward Fold. With your palms planted firmly into the mat, step back into Plank Pose, and hold for a few breaths. On an exhale, drive your tailbone up and back into Downward Dog. On an inhale, send your right leg up into Three Legged Dog. On an exhale, sweep your right leg forward and step into Low Lunge. Rather than going into the full expression, keep your palms on the ground and left knee lifted. On an inhale, rise up into Warrior II, adjusting your stance as necessary. Stay here for a few breaths. On an exhale, bring your hands down to the ground and step back into Plank Pose. Hold for a few breaths. On an inhale, send your left leg up into Three Legged Dog. On an exhale, sweep your left leg forward and step into Low Lunge, modifying as you did before. From Downward Dog, come down to your knees and lay on your back. Move into Happy Baby Pose, holding for about 30 seconds. Bring your knees into your chest, and move into Reclined Spinal Twist on your right and left side. Hold each side for about 30 seconds. Finally, straighten out your legs and move into Corpse Pose. Hold the pose for at least a minute, but stay for as long as you’d like. Now that you have an understanding of these foundational poses, have fun with your practice! Explore the poses, and create your own sequences that make you feel centered in both the mind and body.